What Are Pre glued Hair Extensions? "What are pre glued hair extensions?" Pre glued hair extensions are a type of hair extension that have a glue-like substance at the tip of the hair in order for the hair extension to be glued (or rather, bonded) to the wearer’s hair. There are different types of pre glued extensions which have different names to either describe the shape of the tip or the substance used at the tip of the hair extensions. "What are the different names for pre glued extensions?" The most commonly used names for pre glued extensions are i-tip hair extensions; keratin tipped hair extensions; nail tip hair extensions; u-tip hair extensions; flat tip hair extensions; v-tip hair extensions and pre-bonded hair extensions. Nail-tip, u-tip, flat tip and v-tip hair extensions are the basically the same type of hair extensions and the names are based on the shape of the keratin tip (see images). They are shaped this way to form a tight and complete seal and make the attachment process quicker. "How are pre glued extensions attached?" The tip of the hair extensions is coated with keratin (usually, there are other types of tips) and it’s this part (tip) of the hair extension that is used to bond it the hair extensions to the wearer’s natural hair. The keratin tip is heated in order to soften it and attach it to the wearer’s hair. "Are nano-tips and stick tips used the same as pre bonded hair extensions?" This is a tricky one and as it’s tricky, it’s probably best to look at each type separately. Nano tip hair extensions are the hair extensions that are used with nano rings. Nano rings are basically smaller versions of the micro rings used in micro ring hair extensions (also called micro bead hair extensions and micro loop hair extensions). 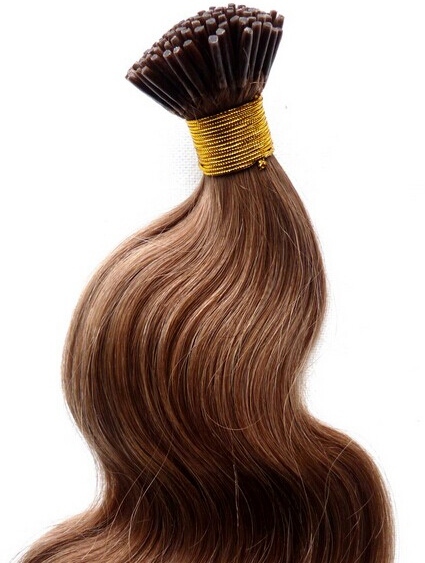 The tips of the nano tip hair extensions are bonded – as that’s how the strands of hair extensions are held together. However they are not attached to the hair by heating the tips, they’re attached to the hair using nano rings. 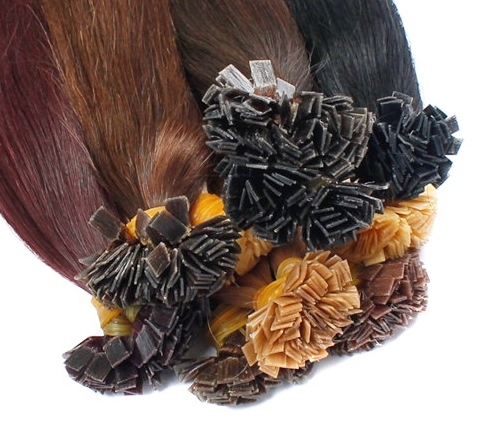 Stick tip hair extensions (also called i-tip hair extensions) are the hair extensions that are used with micro rings. Micro rings are the larger (and original) version of nano rings (which are used in nano ring hair extensions). The tips of the stick tip extensions are bonded in order hold the 80 or so strands of hair together. Stick tip hair extensions are attached using micro rings and not by heating the tips (see? Told you it was a tricky one). That’s the hop, skip and jump through pre glued hair extensions. As you can see, the world of hair extensions can be confusing with terms like pre glued hair extensions (also called pre bonded hair extensions), nano tip hair extensions, micro ring hair extensions, stick tip hair extensions… to name but a few. Nevertheless, hopefully the information above has helped clarify the differences and similarities in the family of hair extensions known as pre-bonded and pre glued. If you’d like more tips, take a looksee at our Hair Extensions Q&A section or if you'd like to be first to read new guides and articles, why not join our blog - it's easy to do and doesn't require any personal info - yippee!